Location: Tye River, Nelson County, VA. Course: Put-in on the Tye River about 2 miles downstream of the community of Tye River Depot. Take-out on the Tye about 2 miles upstream from the confluence of the Tye and James rivers. Many thanks to Sue and Ethan Saliba for allowing us to use their property on the Tye River. Looking foward to running Rock Pile Rapid. The Outstanding Paddler Award for 2017 goes to Dave Segars. Dave Segars accepts the Outstanding Paddler Award. The Outstanding Paddler is awarded to the paddler who, in the opinion of our panel of race judges, has the best performance. Age, gender, boat type and other factors are taken into consideration in making this award. Each year the name of the award winner(s) is inscribed onto a brass plate that is mounted onto a ceremonial paddle displayed in the Nelson Center in Lovingston, VA. An additional wooden paddle is inscribed and given to the winner(s) of the award at the culmination of the awards ceremony. The Nelson Downriver Race is held annually, normally on the first Saturday of May. Normally, the entire race is on the Tye river but due to low water conditions the race may be moved downstream. 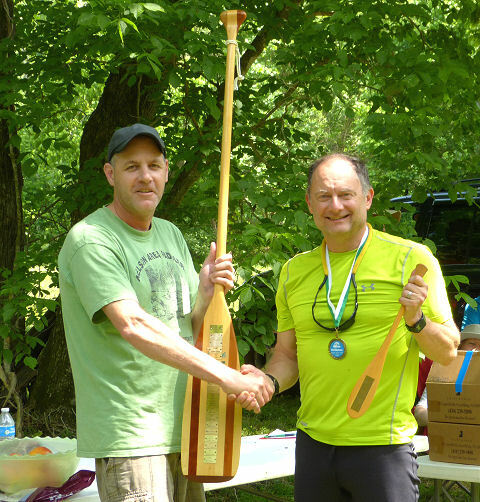 This year's participants included 2 ACA national whitewater downriver racing champions. The reason for the distinctions (different classes) is that it is very difficult to judge the comparative paddling abilities of individuals when they are paddling different kinds of boats. The longer, stiffer, lighter and more narrow a boat is the faster it tends to be. Unfortunately, in many races there are not enough participating craft to divide them into proper classes. In fact, in some events, notably many triathlons, no distinction is made whatsoever. Obviously some attempt should be made to create classes of comparable boats whenever possible. A short, broad kayak designed for fishing in a pond is certainly no match for an Olympic racing canoe, so narrow (and fast) that only highly trained paddlers can stay upright for more than a few seconds. Probably the easiest and most useful distinction is that used at the National Downriver Whitewater Recreational Canoe Championships sponsored by the American Canoe Association. Boats that compete there are divided into 2 classes referred to as formula 16 and formula 14 (or sometimes as 16% and 14%). Formula 16 boats must be made of plastic (vinyl/ABS, polyethylene, etc.) or aluminum or wood/canvas. Additionally, the ratio of the width of the boat mesasured at the 4 inch waterline to the length of the boat may not be less than 16%. These must be (or must have been) commercially available boats. Some modifications such as the inclusion of a limited amount of additional flotation may be made. However, allowed modifications are very restrictive. The formula 14 category is designed for faster boats. These boats may be constructed of other lighter materials such as fiberglass, kevlar, woodstrips, graphite and carbon fiber. The ratio of the width at the 4 inch waterline to the length may not be less than 14.375% for formula 14 boats. Unfortunately, ABS layup canoes are no longer being produced. Numerous other layups are now being manufactured. This has greatly complicated canoe classification. Our recommendation is to now base classification on dimensions and weight regardless of materials. This does give an advantage to boats with the stiffest materials but may be the most useable method of classification. Discriminating between kayaks is even more difficult than for canoes. Kayaks may be divided due to material (plastic or fiberglass) or length. Four meters is the traditional dividing line although the length appears to be increasing in recent years. The shape of the kayak may also be considered. For example, the width to length ratio, as with canoes, has a significant impact on hull speed. The Ski Barn - Nellysford, Va.
McBride/ Blackburn Opticians - Lynchburg, Va.
Rockfish Gap Outfitters - Waynesboro, Va.
Appomattox River Co. - Farmville, Va.
Stoney Creek Auto Center - Nellysford, Va.